When I came across this lovely poem by Carl Sandburg, I couldn’t help but think about love of the autumn season, the beloved the poem describes, and my growing interest in honey-white buckwheat. Most of us in Western countries know little about buckwheat. Sure we may have heard of blinis (Russia’s famous small pancakes), elegant Japanese soba noodles, and the galettes and crêpes of Northern France—all made from buckwheat flour, but there’s so much more to the tiny triangular (and somewhat heart-shaped) seeds that give gray-ish color and an earthy flavor to the flour that make up those traditional dishes. Buckwheat, despite its name, is actually not a type of wheat. Technically a pseudo-grain, buckwheat is a seed of a plant related to rhubarb, sorrel, and knotgrass. Its seeds can be used in salads, porridges (like my Teff and Buckwheat Porridge or Peach Buckwheat Porridge), or as an alternative to rice in risotto or pilafs. Ideal for vegetarians and vegans, buckwheat is a quality source of a complete vegetable protein, containing all essential amino acids. Gluten-free, buckwheat is also great for those sensitive to wheat or gluten. Buckwheat can be purchased in its hulled grain form (known as groats), as flour or as puffed buckwheat. In processed form, it can be purchased as pasta or noodles. You can buy the groats raw or toasted. Roasted buckwheat, referred to as kasha, is aromatic and has a distinctive and strong nut-like flavor. If you can’t find kasha, you can easily toast buckwheat groats. It only takes a few minutes and some would argue that it tastes better than buying commercial toasted buckwheat. Toasting raw buckwheat yields a milder flavor and lighter color. It really is a matter of preference. For some, buckwheat (raw and/or roasted) is an acquired taste. Its distinct earthy flavor can polarize people, but it grows on you the more you eat it. If you haven’t tried cooking with the raw kernels yet, I definitely encourage you to try it. Buckwheat is so versatile. I’ve enjoyed exploring the many ways I can use it in my kitchen—from appetizers (Buckwheat-Polenta Fleurettes) salads (like this one) to porridge (Teff and Buckwheat Porridge and Peach Buckwheat Porridge) to granola and granola bars (Ginger Almond Hemp Granola, Hazelnut Buckwheat Granola Bars, Superfood Green-ola Bars) and dessert (Chocolate-Hazelnut Buckwheat Tart. If you haven’t yet, try it sometime. When I came across a recipe for warm buckwheat salad by Lakshmi, of the lovely and informative blog Pure Vegetarian, I knew I wanted to try my own version as soon as possible. I used kabocha squash and anasazi beans here, but almost any winter squash and legume would work well instead. 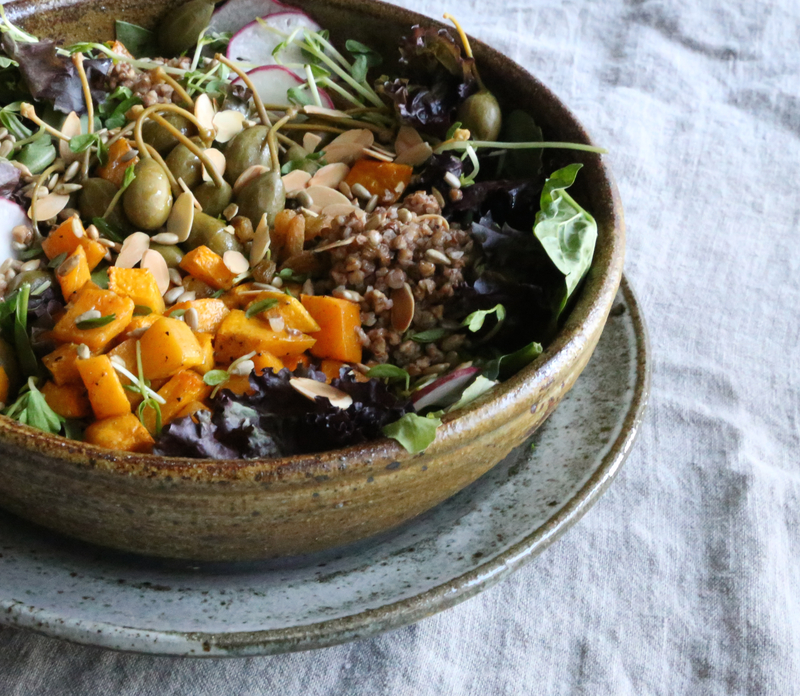 Salads love to accessorize so feel free to try different herbs, beans, squash and nuts when you make your own version. If you can’t find caper berries, try green olives or nonpareil capers. 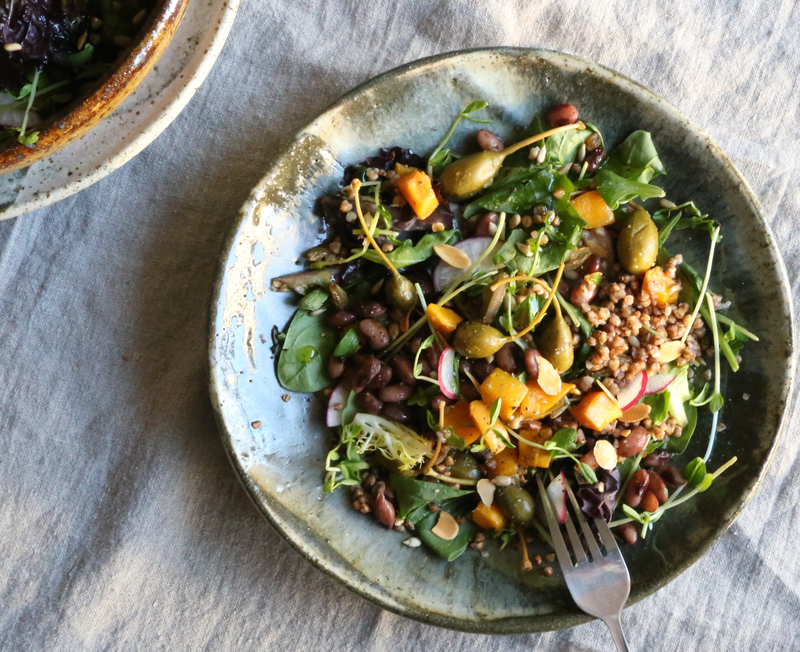 I hope this salad inspires you to add a little more buckwheat to your table. Cut the kabocha squash in half, scrape out the seeds, then peel the hard skin and cut it into ½-inch pieces. Toss the squash pieces with olive oil, a large pinch of salt and garam masala and spread them onto a baking sheet. Roast the squash for 20-30 minutes, turning and mixing them a couple of times during the roasting time. The squash should be tender with some nicely browned spots. Allow squash to cool. Meanwhile, bring water to a boil. Add kasha and stir. Reduce heat, cover and simmer until most of the water is absorbed, about 10 minutes. Fluff lightly with a fork. Make the dressing by whisking the ingredients together in a small bowl. When kasha is done, toss with some of the dressing. In a large bowl, combine greens, beans, caper berries, radishes and raisins. Add cooled and dressed kasha. Drizzle the rest of the dressing. Toss again and taste. Add salt if needed and adjust the amount of oil and lemon juice to your taste. Toss the squash in very gently at the last minute. Sprinkle with toasted almonds and sunflower seeds. 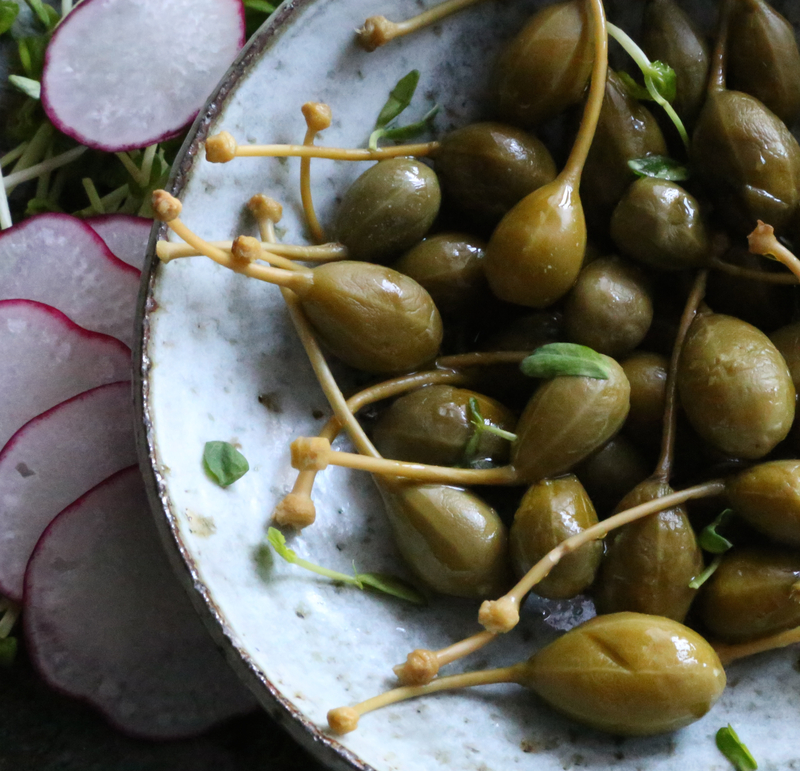 Notes: When using caper berries, you can take off the stems. I left mine on, just because I liked the look for the photos. Also, if preferred, you can cut the caper berries in slivers before adding them to the salad. Thanks for the inspiration Lakshmi. Healthy and bountiful ingredients in a burst of flavors and textures. Yum!